What: Burger restaurant Shake Shack (NYSE:SHAK) saw its stock jump higher by 20% during the month of May, according to S&P Capital IQ data. 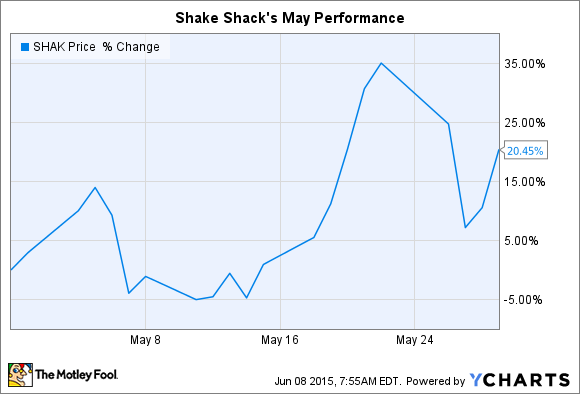 Shares had been up as much as 35% before turning lower to close out May at $83 per share. The stock is currently sitting at 68% above its initial post-IPO trade in late January. Sure, sales were boosted by 3 new restaurants added to Shack Shack's 34-unit domestic portfolio. But the better news for the business was the fact that sales at existing locations bounced higher by 12%. That result was powered by higher menu prices, as well as by successful new product introductions. Shake Shack also managed to book surprisingly high profits. Adjusted earnings were $0.04 per share while Wall Street analysts were forecasting a loss of $0.03 per share. Thanks to the surging revenue result, Shake Shack's operating margin rose by 3 percentage points to reach 26% of sales. Now what: Management expects to open at least 10 new company-operated Shacks in the U.S. in 2015 and at least five licensed international ones in the U.K. and Middle East. As of April 1, the company had 66 Shacks, including 39 in the U.S. Meanwhile, comps are expected to grow at a hefty pace, although not as fast as the blazing rise that Shake Shack booked this quarter. CEO Randi Garutti and his executive team are targeting annual sales of $165 million, which would represent 39% growth over 2014's result. But Wall Street has even higher expectations. Analysts are forecasting a 44% sales gain this year. Given the huge range of potential outcomes for Shake Shack's growth from here -- and the premium 23-times sales valuation on the stock -- shareholders can expect more volatile price swings ahead.